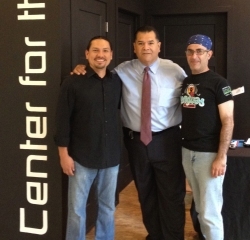 State Senator Martin Sandoval (D-11) toured the site of “Open Center for the Arts,” 2214 S. Sacramento Ave. The center focuses on educating, inspiring, and promoting different artistic expressions of emerging and aspiring artists as well as bridging established artist to new generations. The mission of “Open Center for the Arts” is to provide a space where all artists, can come together to educate, showcase, refine, and develop their talents as well as support entrepreneurship opportunities in the arts while connecting their growth to the community. Pictured left to right: While touring “Open Center for the Arts”, J. Omar Magaña – Financial Director, State Senator Martin Sandoval (D-11) and Roy Villalobos – Media Director.